In this codelab, you'll get introduced to using Cloud Bigtable with the Java HBase client. How would you rate your experience with using Google Cloud Platform? 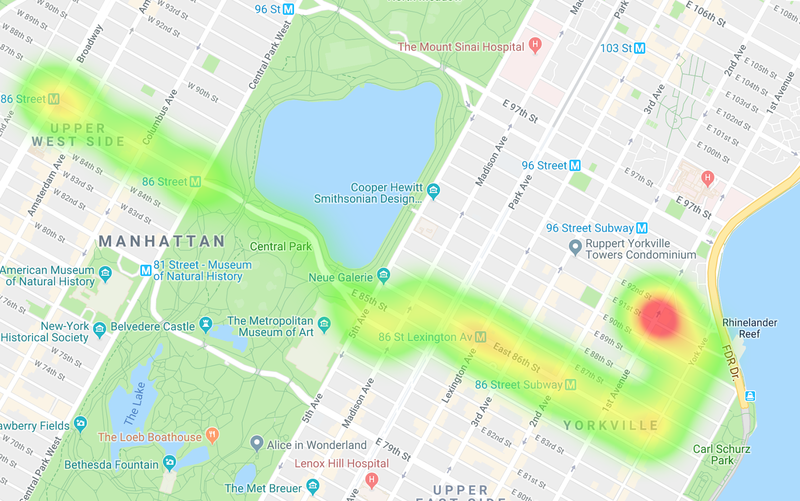 You'll be looking at a dataset about New York City buses. There are more than 300 bus routes and 5,800 vehicles following those routes. Our dataset is a log that includes destination name, vehicle id, latitude, longitude, expected arrival time, and scheduled arrival time. The dataset is made up of snapshots taken around every 10 minutes for June 2017. To get the best performance from Cloud Bigtable, you have to be thoughtful when you design your schema. Data in Cloud Bigtable is automatically sorted lexicographically, so if you design your schema well, querying for related data is very efficient. Cloud Bigtable allows for queries using point lookups by row key or row-range scans that return a contiguous set of rows. However, if your schema isn't well thought out, you might find yourself piecing together multiple row lookups, or worse, doing full table scans, which are extremely slow operations. It is common for tables to have billions of rows, so doing a full table scan could take several minutes and take away resources for other queries. Our data has a variety of information, but for this codelab, you will use the location and destination of the bus. Get the location of a single bus over a given hour. Get a day's worth of data for a bus line or specific bus. Find all the buses in a rectangle on a map. Get the current locations of all the buses (if you were ingesting this data in real time). This set of queries can't all be done together optimally. For example, if you are sorting by time, you can't do a scan based on a location without doing a full table scan. You need to prioritize based on the queries you most commonly run. Get the locations of a specific vehicle over an hour. Get the locations of an entire bus line over an hour. 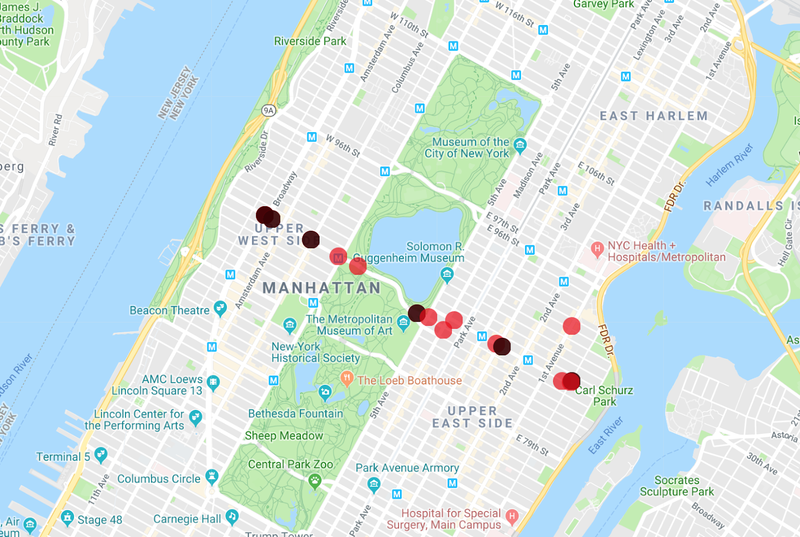 Get the locations of all buses in Manhattan in an hour. 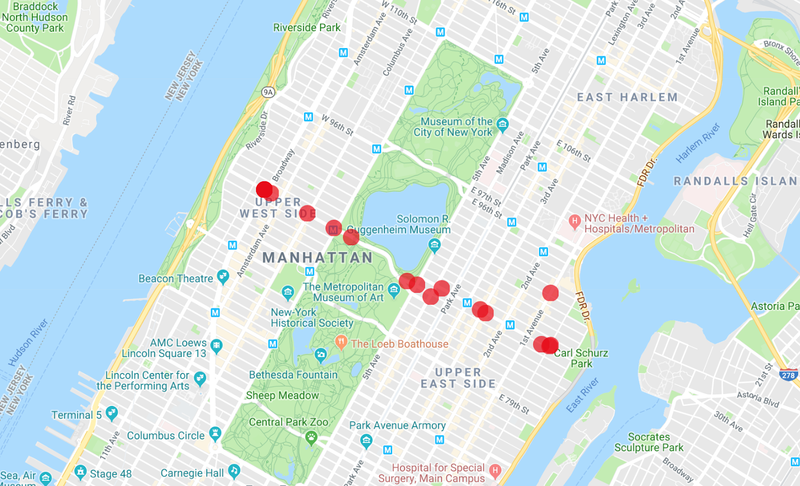 Get the most recent locations of all buses in Manhattan in an hour. Get the locations of an entire bus line over the month. Get the locations of an entire bus line with a certain destination over an hour. For this codelab, you will be working with a static dataset, but you will design a schema for scalability. You'll design a schema that allows you to stream more bus data into the table and still perform well. [Bus company/Bus line/Timestamp rounded down to the hour/Vehicle ID]. Each row has an hour of data, and each cell holds multiple time-stamped versions of the data. For this codelab, you will use one column family to keep things simple. Here is an example view of what the data looks like. The data is sorted by row key. Common mistake: You might think that making time the first value in the row key would be ideal, because you probably care about more recent data, and would want to run queries mainly around certain times. Doing this causes hotspots in the data, however, so you compromise by putting time third. This makes some of your queries more difficult, but you need to do this in order to get the full performance Cloud Bigtable has to offer. Also, you probably don't need to get all buses for a certain time at once. Check out this talk by Twitter for information about how they optimized their schema. Next, you'll create a Cloud Bigtable table. First, create a new project. Use the built-in Cloud Shell, which you can open by clicking the "Activate Cloud Shell" button in the upper-righthand corner. Cloud Shell comes with the tools that you'll use in this codelab, the gcloud command-line tool, the cbt command-line interface, and Maven, already installed. Enable the Cloud Bigtable APIs by running this command. Make sure you delete the instance when you are done with the codelab to prevent recurring charges. Enable the Cloud Dataflow API by running this command. Run the following commands to import the table. You can monitor the job in the Cloud Dataflow UI. Also, you can view the load on your Cloud Bigtable instance with its monitoring UI. It should take 5 minutes for the entire import. The first query you'll perform is a simple row lookup. You'll get the data for a bus on the M86-SBS line on June 1, 2017 from 12:00 am to 1:00 am. A vehicle with id NYCT_5824 is on the bus line then. The result should contain the most recent location of the bus within that hour. But you want to see all the locations, so set the maximum number of versions on the get request. Now, let's view all the data for the bus line for that hour. The scan code looks pretty similar to the get code. You give the scanner a starting position and then indicate you only want rows for the M86-SBS bus line within the hour denoted by the timestamp 1496275200000. Run the following command to get the results. The Map Maker app can display multiple lists at once, so you can see which of the buses are the vehicle from the first query you ran. An interesting modification to this query is to view the entire month of data for the M86-SBS bus line, and this is very easy to do. Remove the timestamp from the start row and prefix filter to get the result. // since there are so many data points. If you copy the results into MapMaker, you can view a heatmap of the bus route. The orange blobs indicate the stops, and the bright red blobs are the start and end of the route. Next, you will filter on buses heading east and buses heading west, and create a separate heatmap for each. Note: This filter will only check the latest version, so you will set the max versions to one to ensure the results match the filter. Read more about configuring your filter. Run the following command to get the results for buses going east. Run the following command to get the results for buses going west. 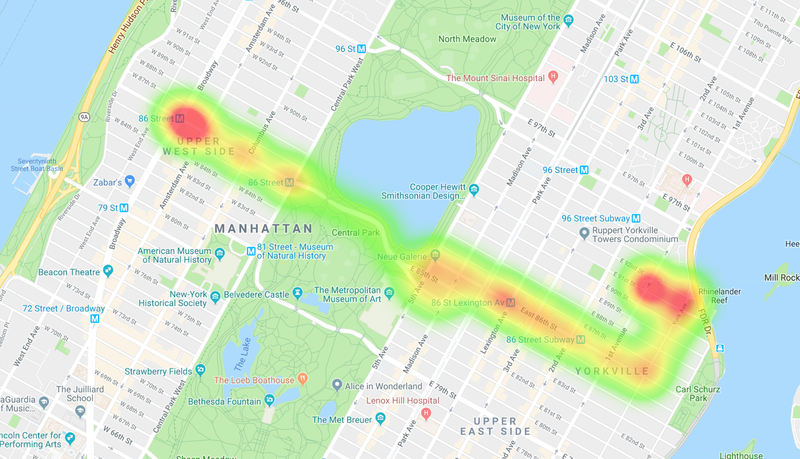 By comparing the two heatmaps, you can see the differences in the routes as well as notice differences in the pacing. 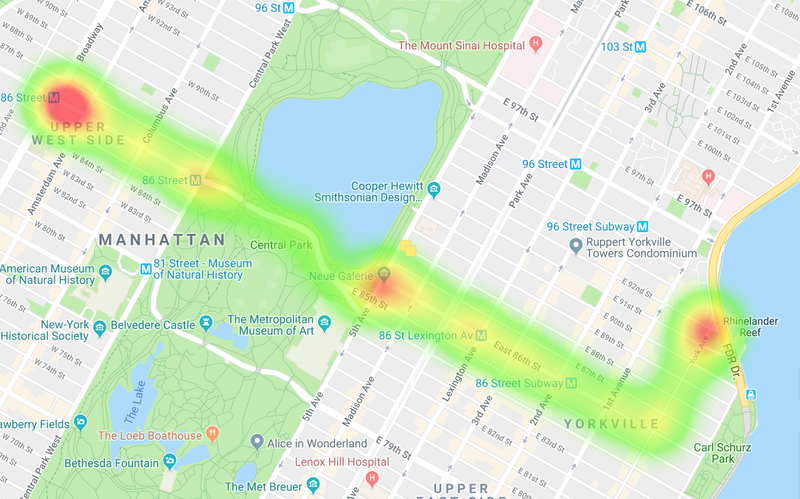 One interpretation of the data is that on the route heading west, the buses are getting stopped more, especially when entering Central Park. And on the buses heading east, you don't really see many choke points. To avoid incurring charges to your Google Cloud Platform account for the resources used in this codelab you should delete your instance. Learn more about Cloud Bigtable in the documentation.